How False Testimony and a Massive U.S. Propaganda Machine Bolstered George H.W. Bush’s War on Iraq | Democracy Now! publisher of Harper’s Magazine. He’s the author of Second Front: Censorship and Propaganda in the Gulf War. "Second Front: Censorship and Propaganda in the 1991 Gulf War"
JOHN R. MacARTHUR: Precisely. You’ve got to remember, in 1990, '91, we're only—what?—15 years after Vietnam. And there’s still this very, very bad feeling in the country, that’s represented in Congress by senators like John Kerry, that we were conned into Vietnam, it was an undeclared war, and we weren’t going to get conned again into another phony war or a phony pretext. 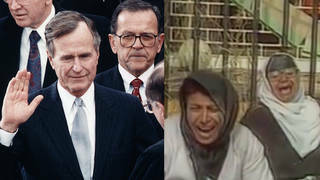 And so, it was clear that Bush was going to have to get congressional authorization for invading—for liberating Kuwait. And so, the vote was going to be very close. It ended up being 52 to 47. It would have been 52 to 48 if Alan Cranston, the senator from California, had come back to Washington to vote. He said he would have voted if it was close. He was undergoing chemotherapy in California.